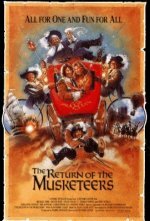 Fifteen years after the success of his sparkling version of Alexandre Dumas's swashbuckling favourite, Richard Lester reunited the musketeers for a tale in which they bid to save Charles I of England from the executioner's axe. Roy Kinnear's tragic death following a riding accident obviously sapped everyone's enthusiasm for the project and, while there are some witty jokes about the ravages of time, this might have been one occasion when the old adage the show must go on could have been ignored. The Dumas book Twenty Years After, on which the story is based, inspired the marginally more successful Bertrand Tavernier film D'Artagnan's Daughter.